Last week, we saw clearly where every Senator stands on climate change, and Sen. Toomey refused to admit that greenhouse gas pollution is causing significant changes to our climate. At a time when we need leadership and solutions, not denial and obstruction, Senator Toomey's vote isn't merely disappointing—it's reckless. 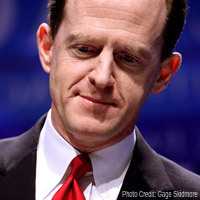 Take action today: Tell Senator Toomey that Pennsylvania deserves climate action, not climate denial. Your vote against the Schatz amendment is not only disappointing. It's reckless and Pennsylvania deserves better. At a time when we need leadership and solutions, not denial and obstruction, your no vote is disappointing. I urge you to listen to Pennsylvania voters and work for solutions to this serious problem. Your vote on the Hoeven amendment proved that you recognize that climate change is real and humans affect it, but you need to recognize what NASA and all major American scientific organization are telling us: that our contribution to climate change is significant. I expect you and all of Pennsylvania's leaders to deal with reality and not hide in denial. Our families, communities, and children are counting on your leadership.